Congratulations Jim! I’ve worked with you as Culver’s Town Attorney, Marshall County’s Attorney and briefly as MCEDC’s Attorney. I’ve always known you to be cautious and ethical, working to keep his clients out of trouble. 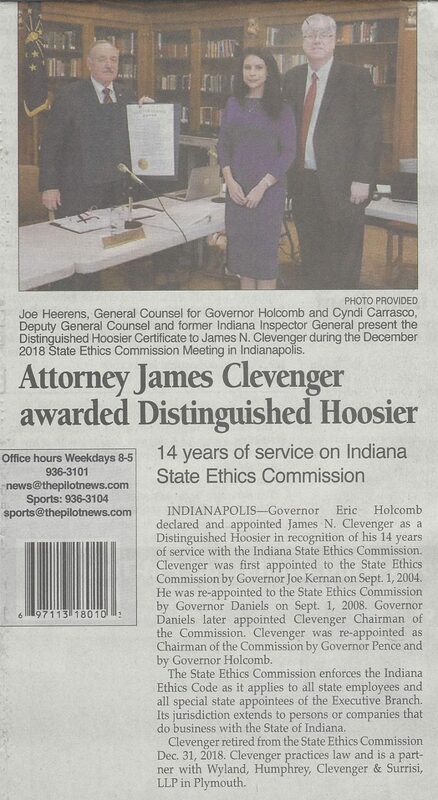 No surprise that you were on the State’s Ethics Commission, though I didn’t know about it until seeing this award upon your exit from the Commission. 14 years! Way to go! Best wishes for your next endeavor. Thanks for your years working to keep the State on the straight and narrow. Please keep up the good work and apply those principles here too! "I was so impressed with Easterday Construction's professionalism, punctuality and quality craftsmanship on this [Dr. James Ford Historic Home] and on other projects they have done for me."